Conowingo is a Susquehannock word for "at the rapids". The Conowingo Dam and Hydroelectric Station, built on the lower Susquehanna River, was opened in 1928. 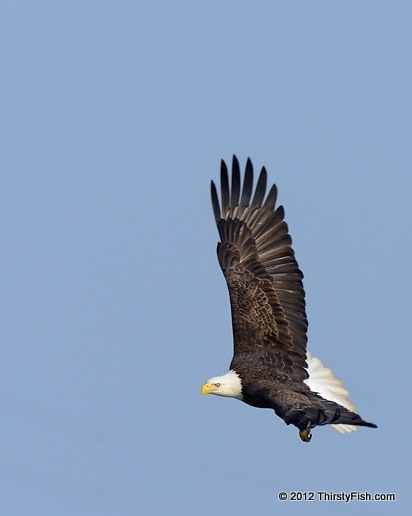 Each November, the Dam attracts a large number of Bald Eagles. This photo was taken yesterday. It was estimated that between 5000-7000 Susquehannock lived in the region in 1600. Here is an excerpt detailing the last days of the Susquehannock people - unfortunately an all too common story: "By 1763 there were only 20 members (all Christians) of this last identifiable group of the Susquehannock. They were totally peaceful, but atrocities committed by others during the Pontiac Uprising of that year outraged the white settlers in the vicinity who just wanted to kill Indians - any Indians - in revenge. Feeling this way they could have grabbed a rifle and taken to the woods to find the hostiles, but there was an easier target closer at hand. As feelings rose, fourteen Conestoga were arrested and placed in the jail at Lancaster for their own protection. A mob formed (known as the Paxton boys). They proceeded to the village at Conestoga, killed the six Susquehanna they found there, and burned the houses. Then they went to the jail, broke in, took the last fourteen Susquehannock the world would ever see ...and beat them to death!"